As part of a year-long calendar of events to mark its 180th anniversary, Perennial will present a show garden at Harrogate Spring Flower Show (25-28 April 2019). 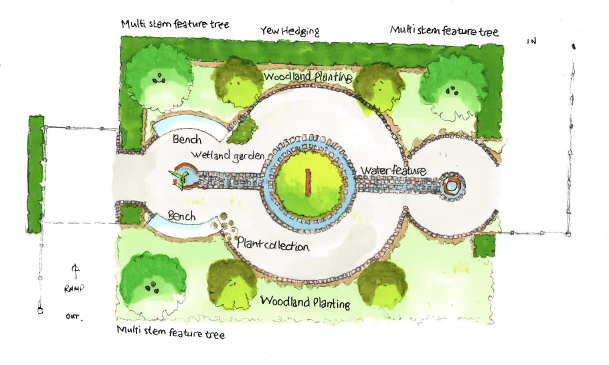 Designed by David Wyndham Lewis, garden designer at Blank Canvas Gardens and Major Gifts Manager at Perennial, the Perennial Legacy Garden represents the lifelong impact leaving a gift in your will has on the people Perennial helps. This garden complements Perennial show gardens at RHS Flower Show Cardiff (12-14 April) and RHS Chelsea Flower Show (21-25 May). The longevity of the charity is represented through the medium of water, reminding us that life emerges, flows through time overcoming all obstacles in its way before returning to the earth. The bubbling, tricking and flowing of water culminates at a still pool which is intended to be a space for people to sit, reflect and remember. Pots & Pithoi is supplying the water feature and a tryptic of artworks by Jane Procter, representing the three phases of life, will hang on the yew hedging. David Massey, based in Knaresborough near Harrogate, will build the garden – he built Perennial’s garden at the show in 2014, which was awarded Premier Gold. While conceptual in its design, the garden could be transferred to a domestic back garden or as part of a larger garden design. The materials are contemporary in feel and the art is a mixture of new works and ancient objects. The pathway cuts through the garden, bringing light into the two woodland areas, which is representative of how Perennial brings light to the darkest of situations. A collection of rare and special plants can be discovered as you move through the garden and a wetland and marginal area is fed from the central water feature. All elements of the garden have been sourced from local crafts people and growers wherever possible. Perennial helps and supports anyone who creates or maintains gardens, parks, sports facilities and other green spaces. The Perennial Legacy Garden at Harrogate Spring Flower Show will raise awareness of the charity in the North of England, helping spread the message that Perennial’s friendly and knowledgeable team has the experience and resources to make a difference to people’s lives, regardless of the scale of their issue or concern.